One thing that I had always looked forward to once I reached the U.S was "eating berries". Not that we don't get strawberries in Chennai. The in-season ones are too good back there but the blue-, black- ones had always caught my attention, not to forget the raspberries and cherries. So the same weekend when we went grocery shopping and when I saw the market loaded with fresh, ripe, almost every kinda berries, I made it a point to buy a packet of each. And I have been enjoying them everyday snacking on them raw or blending them into colorful smoothies. In fact I even made some berry ice-cubes to go with my hubby's glass of whisky. I'll talk about "how I bought the loaf pan" in another post. As of now let's just stick to I have bought almost all kind of baking pans and I am totally in love with them that I make it a point to sneak-peek at them atleast once everyday. They are just right, the way I had always wished my baking pans to be ~ cute, sleek and non-stick. Ok, lets keep the other details to another post. Coming to this bread, you know how I love banana breads. They are the best snack cake to me. So when I saw some over-ripe bananas on discount sale, I just had to buy it. I had my loaf pan, I had bananas, I had some blueberries and finally we had this moist and soft bread for our morning breakfast. I lulled munchkins to sleep and by the time he was up, I had the bread baking in the oven. The whole house was smelling sweet and he was reluctant to have a bite before the loaf had cooled and by the time I had set stuff for the photoshoot he went haywire. I just couldn't click one picture without his cute lil hands sneaking in. And so settled him with one slice of bread and then went for the clicks. Preheat the oven to 350 F. In a large bowl, mix mashed bananas, yogurt and oil, using wooden spoon. Mix in the sugar, egg, and vanilla. In a separate bowl, mix the flour, baking soda and salt. Add this to the wet ingredients, mix just to blend. Mix the blueberries with some flour. Add this to the batter and mix to distribute. Butter and flour a 4*8 loaf pan. Pour the batter into the pan, sprinkle broken cashews on top and bake for 45mins - 1 hour. Cool on a rack. Remove from pan and slice to serve. ** You could add a handful of toasted pecans/walnuts too. ** You can use raspberries or strawberries too. 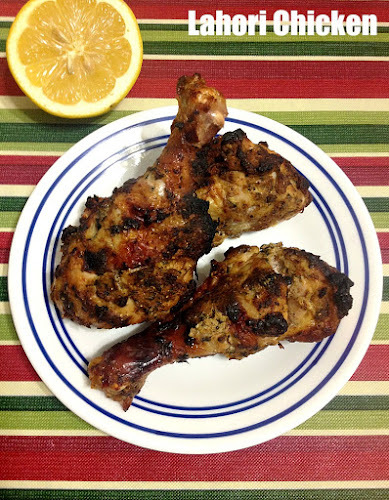 ** The original recipe called for melted butter but I used canola oil instead. Serve with cold milk!!! Perfect to dunk in!!! Perfectly baked bread. Except for strawberries, the other berries I tasted only after coming here..Specially these blueberries, love to bake with them..
Am in love with blueberries too, never failed to get them whenever they shows their head in farmer's markets, bread looks incredible Vimi and very moist. Awesome looking bread. Wonderfully taken pics. nice bread with blueberries....cute hands.. Superb Vimitha. Awesome bread, moist, soft and perfectly baked. Bread looks delicious and inviting. Really super tempting.. and you know I grabbed the berries as first thing when I go for shopping groceries. Love all coloured berries over there. 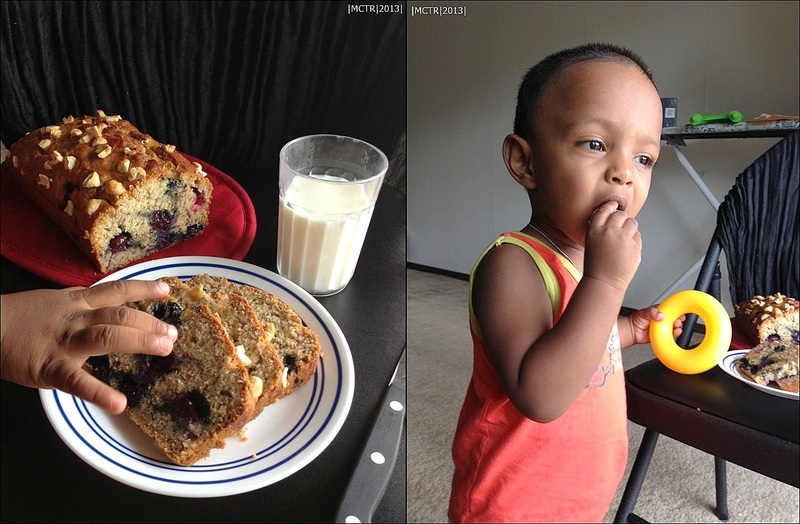 Should try out this combo, banana and blueberries, bread looks awesome..
Moist & yummy bread.. So tempting.. The bread looks super duper delicious with the combo of berries and banana!